Local citations are essential for a successful SEO strategy, especially for real estate investors. Why? Because you’re a local service, and without having local citations connecting your business online you won’t rank high in Google and Bing searches. And, as we’ve been over before, not appearing at or near the top of search engine results is bad for business. We’ve covered the best SEO practices for real estate investors in previous articles. You got a complete SEO checklist, developed a strong user interaction strategy for your website, and learned everything you need to know about black hat and white hat SEO tactics. But we haven’t gone over local citations for your real estate investing business yet. Basically, local citations are places online where your local business information is featured. These sites are more pages that search engines like Google and Bing will use to better index your business for local searches. For real estate investing, having your business come up in local search results is exactly what you want because, as we said, you’re a local service. Think of it this way: it wouldn’t help your business to show up in national searches if you’re selling a house in, say Chicago, because you only buy and sell houses in that area. Someone who finds your business in Miami isn’t a viable lead for you. The correlation between local citations and rankings is important for generating leads for your business. The more consistently you post your business’s NAPs (we’ll talk about that in the next section) the more you are providing search engines with credible backlinks to rank you with. When you have created relevant, credible, and localized citations on local directory website, the more likely you are to rank higher in local searches. You already know that a higher ranking means more traffic to your website, and more traffic from motivated sellers means more business. Let the numbers speak for themselves. According to a study done by Chitika, “92% of searchers choose a business that is on page one of search results.” If that’s no convincing enough to have local citations, I don’t know what is. …name, address, and phone number. These are the key point of information for your local citations. It is crucial that your NAPs are the exact same on every platform your local citations appear in. This information needs to be 100% correct every single time it’s posted because search engines use that information to determine where your business should appear in geo-targeted searches. That might sound intimidating, but it’s really not that bad. If nothing else, you should have your primary business phone number, your local business address, and the name of your business in every place your local citations appear. The best places are directories with reliable reputations. All of these websites are local directories that serve 2 major purposes for real estate investors. Having your business appear on these sites will increase your online presence through relevant backlinks, and give Google and Bing more pages to index. This helps you appear higher in local search results. Helps your customers find your business, and give your service more legitimacy online. Both of these things are important for having a strong SEO strategy, and for building a reliable online presence. Because real estate investing deals so much with establishing trust between you and your clients, the more legitimate you appear online the more likely they are to find you and submit their information to you. The more you appear in local directories, the more avenues you provide your customers with to find your services. As we stated earlier: more traffic means more leads. Just like all SEO practices, local citations take time to get indexed and strengthen your online presence. The general time line is 2 – 8 months, but varies depending on how competitive your market is. The key to successful SEO is not getting discouraged by how long it takes to see results. It will come. With all of the content that your website turns out, your rankings will steadily climb in the mean time. Remember, patience is key for having a successful SEO plan. Local citations are no different. 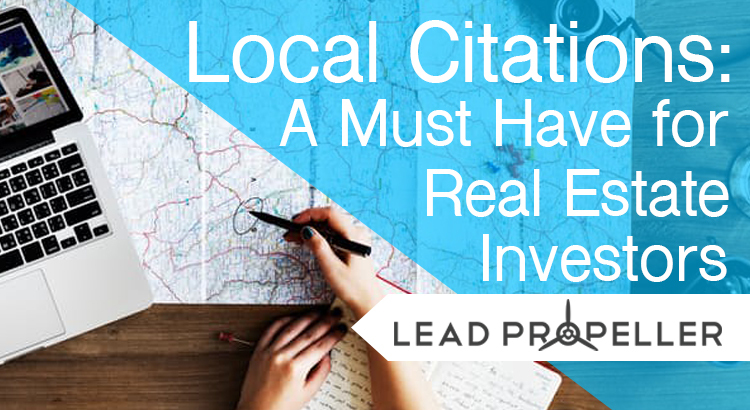 Regardless of how long it takes to begin to see results, local citations are still something that your real estate investing business needs. Setting up your business in the directories mentioned above doesn’t take that long, and is free to do. However, you need to make sure that your information is 100% the same across all platforms. Consistency is key for strong local citations. While setting up your real estate investing business’s local citations doesn’t take too long, it is still at least a full day of work to make sure you’re on the right sites and that all of your information is correct. Per site, you should set aside roughly 15 – 20 minutes when creating your citations. Knowing the best practices for setting up your local citations is where having a successful online presence comes from. Which is why we have free local citation training courses that you can access through your LeadPropeller dashboard! Don’t Have Time for That? That’s fine! As a full time real estate investor, we know that your time is better spent finding leads and closing deals. That’s why we offer local citations building as an included feature in our professionally managed SEO services. No matter what your price range is, there’s no reason why your business shouldn’t have a good online presence. With our SEO service, you get a personalized, professionally managed, exclusive SEO management for your business. Whatever plan you choose to go with, you will have the necessary local citations to make sure your real estate investing business ranks locally. That way you’ll be building your business’s online presence, and generating quality leads online. After all, online leads are better leads. To get your SEO package today, click on the link below! Have a question about the services? Don’t be afraid to call us at (210) 999 – 5187. We’d love to talk with you!